Certificate for payment of a duty for $2.00 on a Two Wheel Carriage ...hanging on wooden springs dated in 1814. 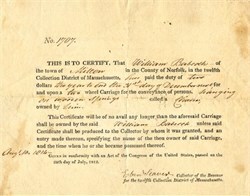 This historic document was printed by the Collection District of Massachusetts. This item has the signature of the Collector of the Revenue, Ebin Seaver for the twelfth Collection District of Massachusetts and is over 194 years old.